It just might be possible to buy the future — and fashion is getting in on the action. Nordstrom Inc., Walmart Inc., PVH Corp. and now Macy’s Inc. have all sought to revamp or reinvigorate by opening their wallets and investing in hip, new concepts, looking to infuse their businesses with new ideas. 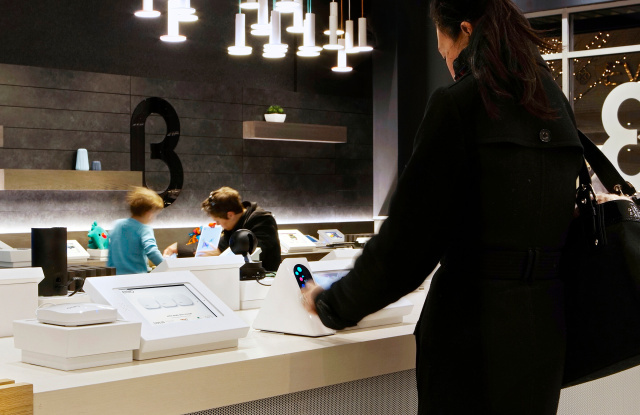 Macy’s bought a minority stake in B8ta last week and said it would use its software, which rents space to brands for a monthly fee, to expand its The Market @ Macy’s “retail-as-a-service” concept. And in May, the company bought Story, which brings an effervescent magazine vibe to retail, and named its founder, Rachel Shechtman, brand experience officer. Dealmaking is nothing new to Macy’s, which itself is the product of decades of transactions boiling dozens of department stores down to one main national nameplate. But this is something different for the department store, which is shifting how it operates on several levels, closing stores, focusing on its best locations and trying to reinvent to meet the challenges of a rapidly changing world. And Jeffrey Gennette, chairman and chief executive officer of Macy’s, told investors that Shechtman and Story could help in that effort. There is plenty of precedent for this approach — although it doesn’t always work. Macy’s is most immediately following in the footsteps of Walmart, which bought Marc Lore’s Jet.com, Andy Dunn’s Bonobos and a string of other techie businesses to do battle with Amazon. Also Nordstrom, one of the strongest players during retail’s recent dry spell, invested in or bought Shoes of Prey, Sole Society, Trunk Club and HauteLook as it felt its way into the future. And last year, PVH Corp. acquired intimate apparel e-commerce player True & Co. and has used its approach to help bolster its Tommy Hilfiger and Calvin Klein businesses. Investment banker William Susman, managing director of Threadstone Advisors, said Macy’s is working to keep up with an evolving market and gave credit to Gennette and Lawton. And the industry might well see more thinking along these lines. “I’m hoping this is the beginning of an avalanche of these kinds of deals because it’s exactly the right thing for [companies] to be doing,” said Mortimer Singer, ceo of Traub. While consumer product companies have readily acquired innovation in the last five years, Singer said it’s an approach that’s just filtering out to retail. “We’re just at the foothills of what is to come,” he said. But a hot new tech idea should not be confused with a silver bullet. Gidumal said acquisitions can bring in new ideas and new approaches, but they have to be part of a broader effort to remake a business. And more than that, it also requires that companies wanting to move forward have a destination in mind. “As a guy who spent most of my career in the transformation world, one thing I learned and I learned it the hard way is that unless you know where you’re going, you can’t transform,” Gidumal said.